I have a queen size platform bed. The usual sized queen quilt is too small and trying a king size was too big. The extra 2 inches on this quilt resulted in a perfect fit. Based on this, I ordered the same quilt in a different color the same day I received this one. Item is well made and light weight, an excellent choice for Southern California. I really love this bedding set. I love that the quilted blanket isn't super thick and heavy. It is a little bit stiff fresh out of the packaging but I seen other reviews that it becomes soft after its first wash and still looks like new even after several washes. It looks really nice on the Handy Living Christie Grey Queen Bed with Nail Head Trim that we just got from Overstock too. Also since we are on bedding I highly recommend Protech Sheets. They are expensive but worth every penny. I have Ehlers-Danlos Syndrome with chronic pain. I toss and turn all over the bed based on my pain. These sheets stay in place and never come off the corners. I love the feel of them too. They stretch so they easily fit over pillow topped beds with a 4 inch gel memory foam topper too. I don't get paid by any of these companies either. I know it's hard to find things online and even scarier to buy without seeing or touching the products. I rely on other actual customers product reviews before I buy anything too so thanks to everyone else that takes the time to write in too. 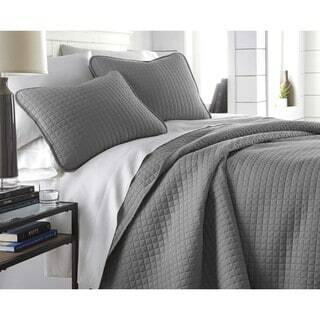 I love the the simplicity of this quilt, both sleek and clean lined. I have a very deep king mattress, about 14 inches, so I ordered the California King/ King, which offered a generous amount to hang and cover the mattress without showing the sheets. The quilt came with 2 shams, which, if you are looking for a simple design, again this is perfect. I love the fabric and its feel. I believe it will be one of those quilts that are warm enough in fall/ winter, but also cool in summer. I have not washed/ dried the quilt, so I can not comment on the durability in that regards. I purchased the slate, which I would describe as a deep ir dark gray. I love the color and its richness. This quilt set was purchased for late Spring/Early Summer in NY. It's a lightweight quilt but not cheesy. Good for milder temps. Definitely not for winter. The color was true to the website. Only issue is that these quilts are not the standard size that you would expect. They are considerably smaller. I have a queen bed with a very high platform and when I buy quilts, I typically buy King and have to tuck them or they are very long (queen is usually a bit shorter than what I like since my bed is so high up). I bought a CALIFORNIA KING in this quilt and it hits the end of my bed frame on all sides, which leaves about 5 or 6 inches from the floor. I have this quilt in white and accent it with turquoise and green. It is lightweight and easy to use, washes well, although I had to stitch up 4 inches of the binding that had come loose. The shams are nice and blend in well with the rest of the Decor.. This quilt is a very simple yet attractive when mixed with other mediums. I would recommend this quilt. It is no oversized . This quilt (and shams) was beautiful right out of the bag. I washed and dried it per the instructions, and put it on the bed...I could not believe how SOFT and luxurious it feels!!! And it's warm, but light-weight. I absolutely love the feel (and look) of the fabric. So happy with it I ordered another one for my guest bedroom. Sizing is great...most quilts are too short, but not this one! Made by "Southshore Fine Linens," and their name really fits in this case. Definitely FINE! In fact, for the price, it's shockingly EXCELLENT. Should change their name to Southshore MOST EXCELLENT Linens. And by the way, the color on my first purchase was true to the web site and exactly what I'd hoped for.